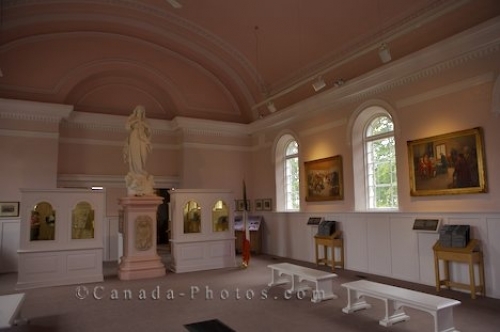 As visitors tour through the Memorial Church at the Grand Pre National Historic Site in the Bay of Fundy in Nova Scotia, Canada, they will admire the historic beauty of the paintings, statues, furnishings and 1920's architecture. A prominent feature in the interior of this church is the Statue of Notre-Dame de l'Assomption which is beautiful as it sits perched upon its pedestal. Statue of Notre-Dame de I'Assomption in the Memorial Church, built in the 1920's, at the Grand Pre National Historic Site, Grand Pre, Minas Basin, Bay of Fundy, Nova Scotia, Canada.